A list of our reports, articles, blog posts, and published letters about fraud (its incidence, prevention, or inquiries into allegations of wrongdoing). Sometimes, the stories I hear at work are completely unexpected. At my son’s football match, I watched from the side line along with other parents, who were becoming increasingly unhappy as their sons in opposing teams tested each other. 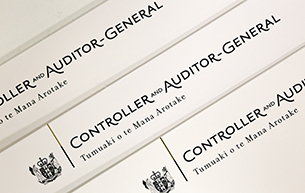 This PDF (64kB, 12 pages) is one of the Auditor-General's Auditing Standards. 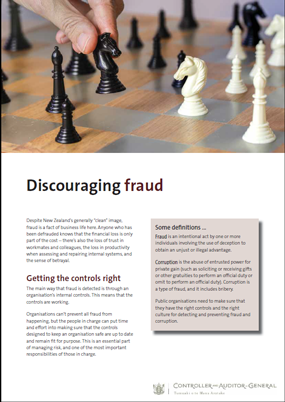 It sets out the auditor's responsibilities relating to fraud in an annual audit. It includes the minimum elements that an entity should include in its fraud policy. June 2012: This report sets out for Parliament and public entities the main results of our survey along with other insights from local and international sources about fraud awareness, prevention, and detection. May 2012: Cleanest public sector in the world: Keeping fraud at bay. May 2012: Summary of our fraud survey results for Airports, Port companies, Electricity lines businesses, Local government - other, and Council-controlled organisations. April 2012: Summary of our fraud survey results for Crown research institutes, Autonomous Crown entities, Crown agents or companies, Independent Crown entities, and Central government - other. April 2012: Cleanest public sector in the world: Keeping fraud at bay. March 2012: Cleanest public sector in the world: Keeping fraud at bay.